It's been an interesting month with plenty going on. For the first three weeks Jane was undergoing her radiotherapy but we still managed to get out in the garden and plenty of cycling. Jane was advised not to swim so she made every effort to compensate with other exercise. With some of our closest friends out of the country in Kenya and Bulgaria we made extra efforts to keep in touch via email with them and visiting those who were still at home. The weather in the first few weeks proved to be very changeable with lower than average temperatures and higher than usual rainfall. On the upside this was good for the garden. 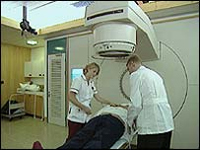 Jane's radiotherapy took place every weekday for three weeks. It required her to visit the hospital at an appointed time and although the treatment itself was completed within 20 minutes with only a minute of actual zapping the whole event could take some time particularly if one of the three machines had broken down or was undergoing maintenance. On these occasions she could be sitting around for over an hour. Steve drove Jane to a lot of the sessions just to make sure she was feeling ok afterwards because we had been told that the body reacted to the zapping and we were led to believe that Jane would become very tired towards the end of the three weeks. As it happens, Jane is very resilient and she didn't feel any more tired than she does normally. The impact on her skin has been interesting but we won't go into more detail here. Once she was through the therapy the doctor was saying that there was some residual activity for about two weeks afterwards (we imagined this to be a bit like a microwave when the food continues to cook after the microwave has stopped) but Jane remains strong and largely unaffected, so her lifestyle has not been affected. The effects of the Tamoxifen that she will now take for the next five years are more apparent than the radiotherapy. The drug has restarted her menopause which she assumed she had effectively finished about a year ago - not a good place to be. For several days Murphy was off his food and it was difficult to get him to eat anything. More than once he started to eat then hissed at his food bowl, a sure sign that he was having problems with his teeth or gums. We took him to the vet who diagnosed that he needed to have a couple of teeth removed, one of his canine teeth was in fact broken. You need to bear in mind that Murphy is sixteen years old and is very healthy for his age so any illness is depressing for him. We took him into the surgery early in the morning and then picked him up again in the late afternoon. Of course cats have to be completely anesthetised for dental work so it does carry certain risks in an older cat. Suffice to say he survived and was quickly back to eating his usual meals. 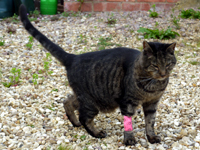 We particularly liked the pink bandage they placed on his front leg where he had the injection and line inserted. Murphy wasn't so keen on it and spent a lot of time walking along and shaking his leg in the hope he would be able to shake it off. Interestingly as he gets older he has become more loving and requires far more affection from us than he ever used to. Most of his life he has been an independent cat but now he likes to sit on one of our laps when we watch TV in the evening. Let's hope he stays healthy for many years to come. All of these routes were recorded on an iPhone App from Abvio, we assume there is an Android version available, and no we don't get commission on sales. Steve has been busy developing his web skills and at last we're beginning to see the results of his struggles with HTML coding. He has this sad belief that because he's bought a book on a subject then he has the knowledge without any effort to read the book, unfortunately reality isn't like that and he has spent many hours getting our web site up to scratch to modern internet standards. The Pig Yard site has been in place for over ten years and as a consequence there are many hundreds of pages that needed revision, luckily there are some fairly clever tools that take some of the hard work out of bringing everything into line. Our archive page is now up and running again unless you attempt to look into the future (Dr Who has that rare capability) but he is working on that error. He also continues to develop the village web site www.rothersthorpe.info with more and more villagers participating. The web site was developed using WordPress and there are so many themes available it is quite easy to make a professional web site without any of the coding associated with the Pig Yard site. Alongside this he has been attempting to persuade Northamptonshire ACRE to set up a county forum of community web site editors so that the expertise held by these people could be brought together and further developments made in helping communities to set up their own online presence. In his spare time Steve has also set up a WordPress web site for our friends Martin & Kate in Bulgaria so they could keep their friends updated on all their news and the improvements they were making to their Bulgarian home. 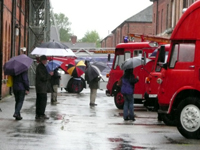 On a wet Saturday morning we planned to drive over to Weedon to take a look around a fire engine museum housed in the old Ordnance Depot. This is an historical site that dates back to the Napoleonic Wars when the Depot was built as the final redoubt should Napoleon invade Britain. The buildings are truly impressive but wasted as storage areas and are slowly decaying. Why doesn’t someone develop them as housing? They would make excellent loft style apartments. We had a brief look round at the various fire engines on display however it was a bit of a “train spotting” event and the fact it was pouring with rain didn’t help. We walked down into Weedon Village hoping for a cup of coffee but the local pub didn’t have any milk or the inclination to make us an instant coffee despite there being nine thirsty customers in his bar. The notion of service in this country is just absent, it never occurs to many businesses to go that extra mile even when your dealing with the owner of the business. I recently read that on average 51 pubs closed every week during 2009, this doesn’t surprise me because they don’t want to change. Once again the film sticks religiously to the book thanks to the strong involvement of JK Rowling. Of course the film couldn't fail to break all box office records and it was a pure delight, with or without the 3D effects. 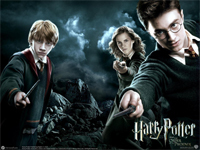 This is the end of an era for us old fogies so it must be even more dramatic for those in their early twenties who grew up reading Harry Potter through their teenage years. The barns have been looking a bit sorry for themselves for some time. The render was falling off and the paint had mould on it, that is where it hadn't flaked off. After re-rendering and painting them Steve put guttering up so we could collect more rainwater. There hadn't been any guttering on them since before we moved in so this has been a real step forward. 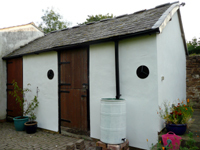 We then moved one of the existing secondary water butts to the base of the down pump and painted it white. Jane painted all the woodwork and metal work black so the doors will now need to be brought up to scratch. Steve has been talking about rebuilding the split doors into one so that it requires only one catch rather than having to lock both doors. 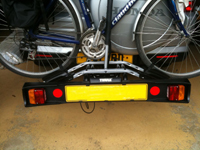 He now has an incentive to get on and do this before the summer ebbs away. 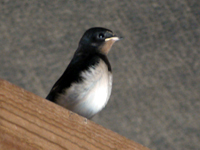 For many years we’ve had swallows nesting in our garage and each year their success varies quite dramatically. In the best year they had three broods with two or three youngsters managing to fledge from each brood however last year was the worst ever when the adults arrived late and after several days of inspecting the nests they left never to be seen again. Thankfully they had not gone for good and two youngsters have just fledged and are gaining experience by flying around the rafters. Hopefully the parents will try for a second brood before the summer is over and they fly back to Africa. As with all things in life there are successes and failures and the vegetable plot emulates life. 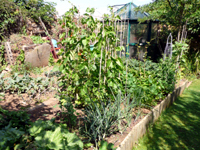 What we never expected is for a packet of sprouting brocolli seeds to grow into a row of weeds, plants that we couldn't identify but they certainly weren't edible. However the tomatoes are coming along and we're already harvesting runner beans, beetroot, peppers and courgettes. Jane's special blueberry plants are also giving her a small but delicious crop. The best is still to come provided we continue to water everything on a regular basis.